There are actually 2 version of the Canonet 28, the standard version which was marketed from December 1968 and had the exposure metering cells all around the lens, in Olympus Pen EE style. The "New Canonet 28" had a single CdS cell in the lens, just over the front element. To add to the confusion, both types were named exactly the same but looked entirely different. Being marketed as "camera for the masses", these "new Canonet 28" cameras are plenty and a little under valued, especially compared to the much higher rated G-III and QL17. One of the reasons will be the need for the obsolete 1.35 Volt mercury battery but this problem can be solved by using a cheap hearing aid battery or a, reportedly working, 1.5 Volt mecury battery replacement. 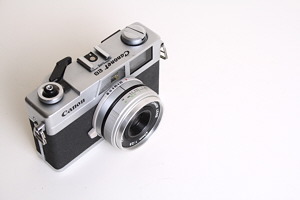 Apparently the built quality is also not very high, well, I've only seen 2 Canonet 28s in my life, one belonging to me now which is a wreck, and the other seemed too expensive and also didn't look to fresh anymore. But two is only a very tiny sample so it's hard to say anything definite. You might be lucky and get one in perfectly working order for not a lot of money. When it works, you might have gotten yourself a perfect inconspicuous street camera, it at least seems to have the right prerequisites. Until then I'll concentrate on the A35F, which actually looks nicer and appears the better camera in my opinion. Note that these cameras suffer from gooey light seals so better get your kit from someone like "Interslice" and repair it before you shoot your first film only to find out afterwards the light traps are shot. 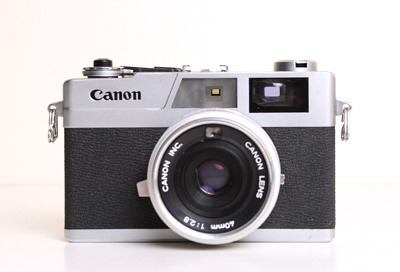 The Canonet 28 was followed by the Canon A35F, which was the last of the series of range finders. The onset of autofocus and plastic cameras that followed, definitely took the place in the market away from high quality sturdy metal cameras. Of course, most consumers were, and still are, looking for cheaper, everything-auto cameras. Using a replacement battery (alkaline type 635) reportedly works for negative film. The exposure will often be a little off but still within the limit of negative film. You might also want to try slide film in the camera but depending on the state of the battery, exposure may be off and it might show. So better be careful and run a test film before taking this camera as your only camera on a once-in-a-lifetime holiday. When light falls on the CdS cell, the exposure metering system is active and slowly draining the battery. So it's advisable to either store the camera with the lens cap on the lens and/or in a dark place and/or with the batteries taken out. Latter is a good idea anyway, there are incountable cameras with dirty/destroyed battery compartments due to forgotten batteries that started leaking. Filter size : 48 mm, filter placed in front of the exposure cell so no manual filter factor calculations needed. Viewfinder : Bright finder with basic parallax correction marks, so you still need to think and guesstimate the actual picture you'll be taking on close distances. Shutter speed scale and exposure warning marks. Shutter : Stepless leaf shutter. 1/30 - 1/620 second. Automatically set by the exposure meter. Aperture : automatic: stepless f/2.8 - f/14.5. Reportedly usually a medium aperture is selected. Flash : Automatic flash with Canolite D. The hotshoe provides an additional contact for usage with the Canolite D.
With standard manual flash types, the aperture needs to be set manually and when not used on a flash bracket, need an additional hot shoe adapter. In this case, sync speed is 1/30 second. Which is a little unusual for leaf shutters as they technically sync at any speed. Flash Contact : only direct connect type CAT signal contact. Film Advance : Manual, single stroke (partial strokes not possible). Note: Using the text or images on this site in an auction such as eBay without permission is a violation of your ebay Terms of Service. I will report you to ebay if I discover such a violation taking place. This may result in your account being cancelled.  I also reserve the right to file claim for civil penalties.